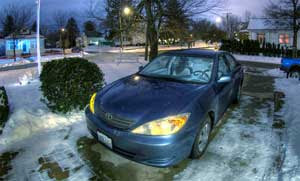 This is a picture I took the other night to show Jason my new (well new to me) Camry. It is made of three shots taken in the dark with just the porch light on. I did three long exposures and during the longest exposure I flashed the lights with the remote and the interior light also went on. This combined image is the result. I have been having fun with HDR (High Dynamic Range Image) these days and I will likely post a few more soon. I am also editing a video and have been playing around with some new 360 tools and Flash.